I have divided the pages for Rodalquilar into sections that I hope will match viewer's interest. Thus the main page includes a description of how to find the mine, a brief history of the mines, an explanation of the extraction processes and some pictures of the site. 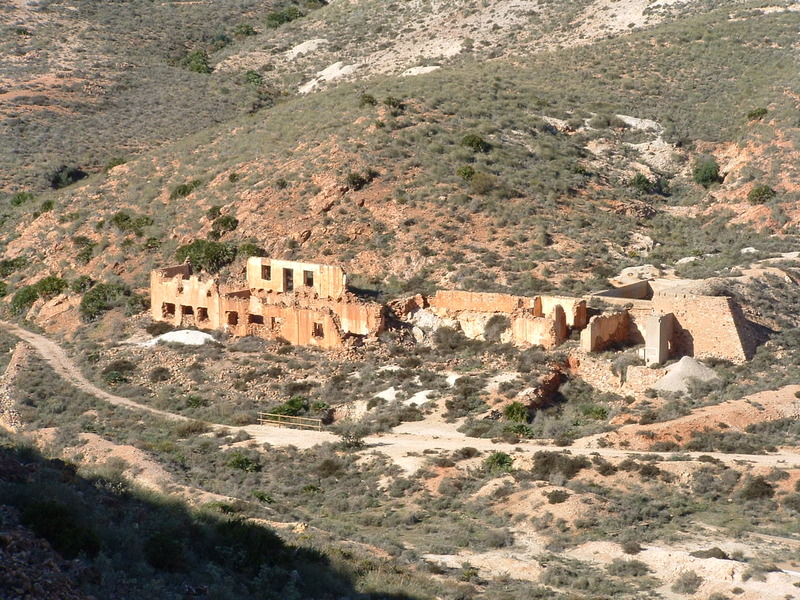 Further pages give a pictorial record of mining in the Cabo de Gata, a detailed diagram of the elements of the remains and a more detailed history of the mines. I can thoroughly recommend the map "Parque Natural Cabo de Gata Nijar" at 1:50000, international number 8 423434 120304. Rodalquilar lies on the scenic road from San Jose to Las Negras. The mines are signposted (and can be seen) as you approach the village. Apart from the mines themselves there is an excellent building which houses an exhibition of the Andalucian region showing mountains, parks, development, ecology and much more. A whole room is dedicated to the gold mines. Beyond the present day village (which has some pretty streets and some places to eat) are the rather sad remains of the mining village. The street grid pattern is there and some old signs (some in English) remain. Next to the exhibition hall is a (free) ecological garden where indigenous plants are set out in groups. If you don't mind driving along unsurfaced roads, you can drive up and round the gold mine. The road leads to Albericoques (Apricots) village, passing the site of some of the old lead and iron mines such as Maria Josefa (see pictorial section). Where gold exists in nugget form it can be mined directly, or even picked up on the ground. Smaller particles are often washed out of the ground and picked up by panning in streams. However when the gold is mixed up with other ores in solid rock, it has to be removed by chemical processes. Such was the case at Rodalquilar. The problem with chemical processes is that it relies on dangerous procedures both during and after production. At Rodalquilar two processes were used, mercury and cyanide, both highly toxic. Gold will form an amalgam with mercury so the finely crushed ore is passed over this. The gold is then removed from the mercury by distillation or filtering through leather. Unfortunately mercury vapour is highly toxic - remember the mad hatter in Alice in wonderland? This was because mercury was used in the hatmaking process and hatmakers frequently became mentally disturbed because of the vapour. Ideas were developed to alleviate this problem but I suspect they were too late for the early mines that used mercury. It hardly needs saying that cyanide is a deadly poison. At one time it was a big favorite with crime writers such as Agatha Christie. Not only is it lethal on its own, the by products of gold production are also hazardous. Sunlight, of which there is plenty in Almeria can produce vapours and other delightful stuff such as arsenic and mercury. On top of all that, the remaining slurry is a biohazard. Today it is treated, then they just dumped it in a pit. I was surprised to discover that most of the cyanide produced today is used for other products, including, surprisingly, cosmetics and food processing. Other areas include plastics, adhesives, fire retardants, pharmaceuticals, and as an anti-caking additive for table and road salts. Only about 15% is now used in gold production. 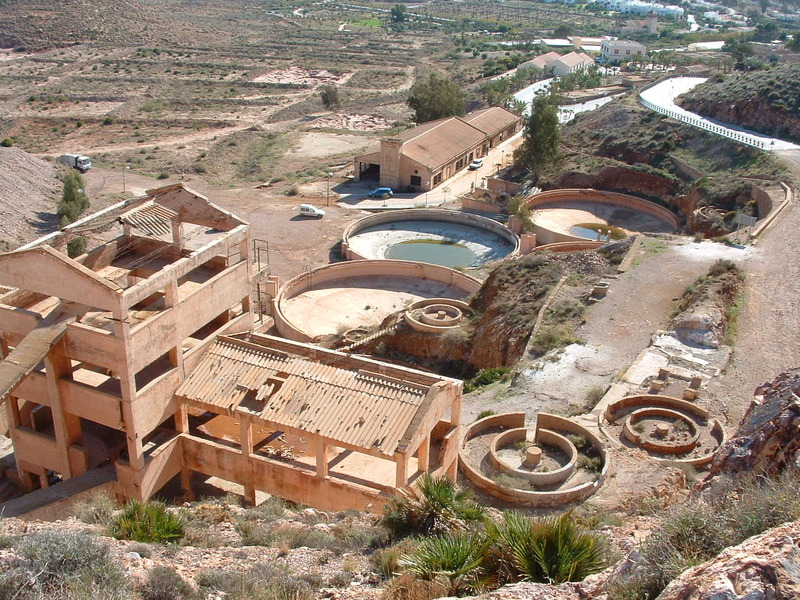 The history of mining in the Cabo de Gata area goes back thousands of years. Copper, Alum, Lead, Silver and Zinc were just some of the minerals mined1. However, it wasn’t until the late 1800s that gold was discovered. Many small mines were opened up but it was 1925 before the first serious attempt was made. 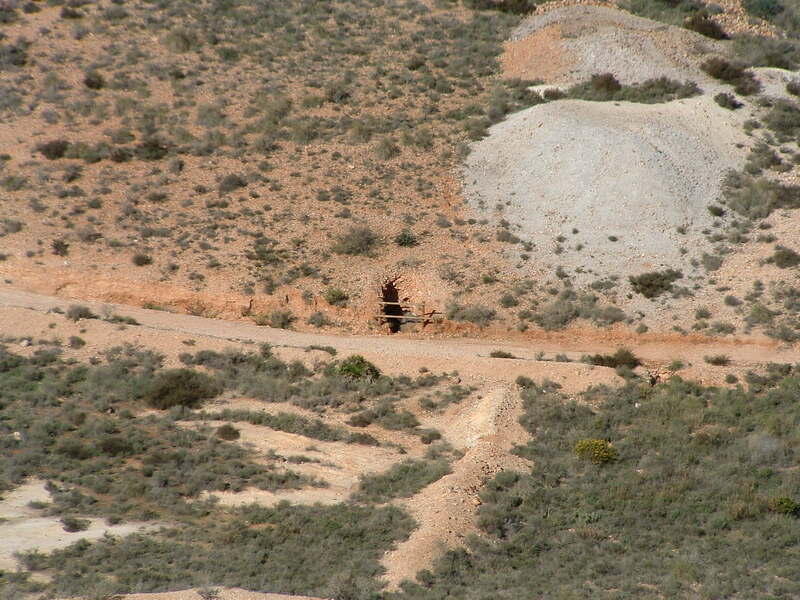 This was by the Rodalquilar Gold Mines Company. They used mercury to dissolve the gold as did a later company, the Exploitation of Rodalquilar Gold Mines. Both mines failed to make a profit and closed down. In 1931 a new company started, the Rodalquilar Mines Ltd, using the cyanisation method. This was known as the Dorr Mill. This company, which used British experts was quite successful and carried on until 1936 when the civil war forced its closure. They extracted close to two tons of gold. After the war, the mines were nationalised and in 1942, the company called ENADIMSA was formed. This mouthful meant in English, the Adaro National Enterprise for Mining Ltd. New mines were opened and a new large smelter called the Denver Smelter was installed. 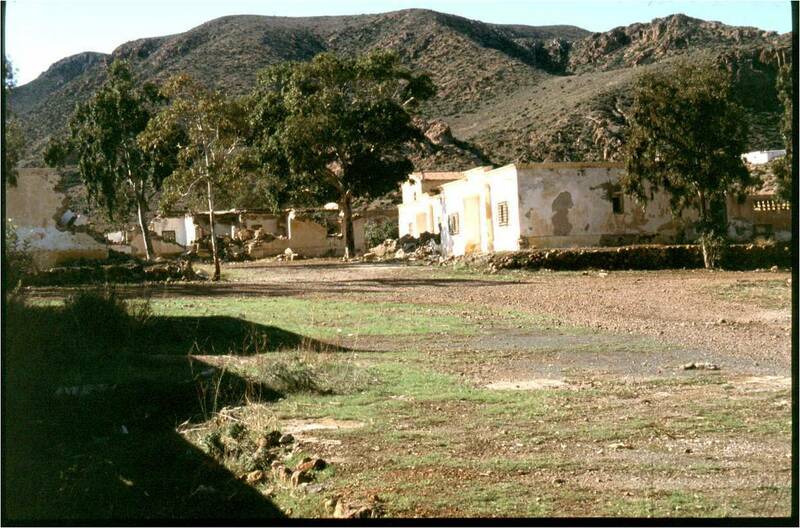 By the end of the 1950s, mining reached its peak and the village of Rodalquilar grew to 1400 with facilities such as doctors and schools normally only found in large towns. The expert’s estimation of the gold reserves proved to be wildly optimistic2 and in 1967 the mines closed. The population of the village dropped to less than 100. There was one more effort to extract ore. In the 1980s an American enterprise called St Joe, which was a subsidiary of the multinational company Cluff Resources and Antofagasta Holdings tried. It wasn’t to be however and in 1990 the mines closed permanently. Today the mines can be visited (with great care!) as can a new and wonderful exhibition hall next to the mines. 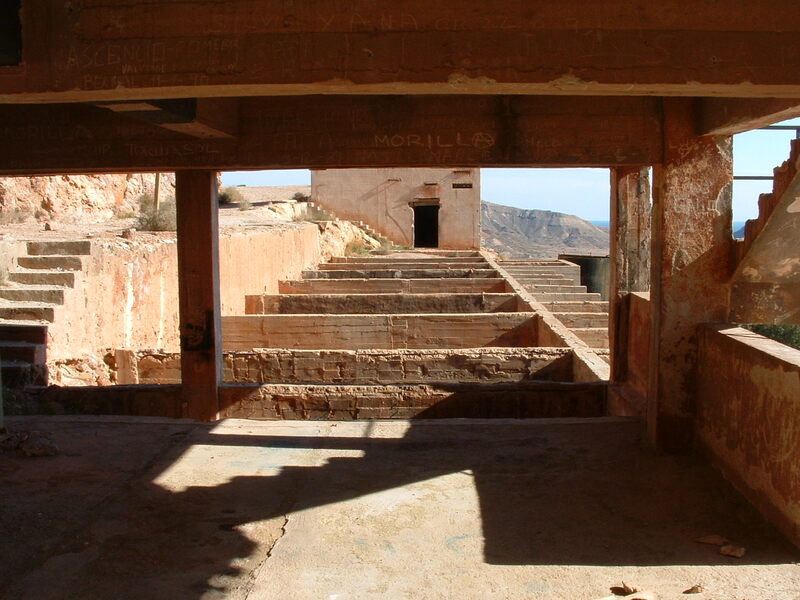 The hall gives information about the mines, geology and terrain over the whole of Andalusia, but has a room dedicated to Rodalquilar, with a wealth of information. 1In 1953 various Roman tombs were found in a necropolis. They were of stone and had been robbed out in antiquity. The only object found was the mouth of a glass vase. However, in the hills nearby, Roman ceramics have been found. This necropolis has to belong to a Roman mining village of a late era (after the 2nd century), remote from the normal Roman routes. General view of the workings. The trituration (crushing) tower is at the rear left and the various tanks are in front and below. The Electricity Tower.The writing on the tower has nothing to do with mining and is explained in the text below. View across from the crushing tower to the electricity tower. Gap where the ore used to cross from the mines to the towers. 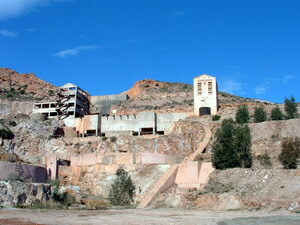 Remains of the mine buildings. Entrance to one of the mines. Looking down the workings showing the cyanisation tanks. Foundry and refining building, now an exhibition hall. Part of the old mining village (below). What is Guard Block D? For many years I was baffled by the large letters on the transformer tower (GUARD BLOCK D) and the trituration tower (DORM BLOCK A). They could not ever have been accommodation so what did they mean? The mystery was solved when I recieved an email from David Buckman which is shown below. I was watching a movie called "SolarBabies" from 1986 and there are numerous desert scenes and some scenes filmed in some circular 'tanks'. There's also a bunch of shots of the overall compound where orphans are held (if you're familiar with the movie, then you know what I'm referring to; if not, well... do a bit of Googling LOL). 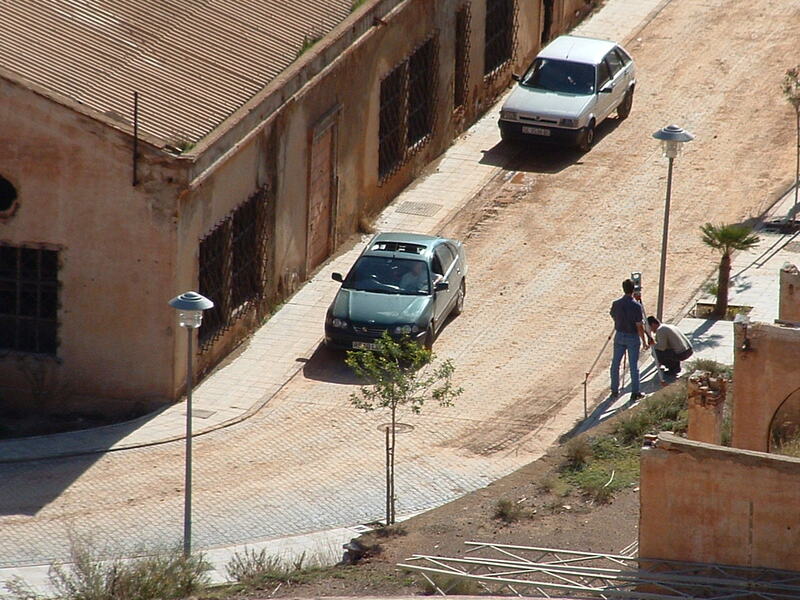 Anyway- I was curious about where the movie was filmed, and it turns out that many of the scenes were filmed in Spain at the retired Rodalquilar mines. So I researched Rodalquilar and came across your web site. 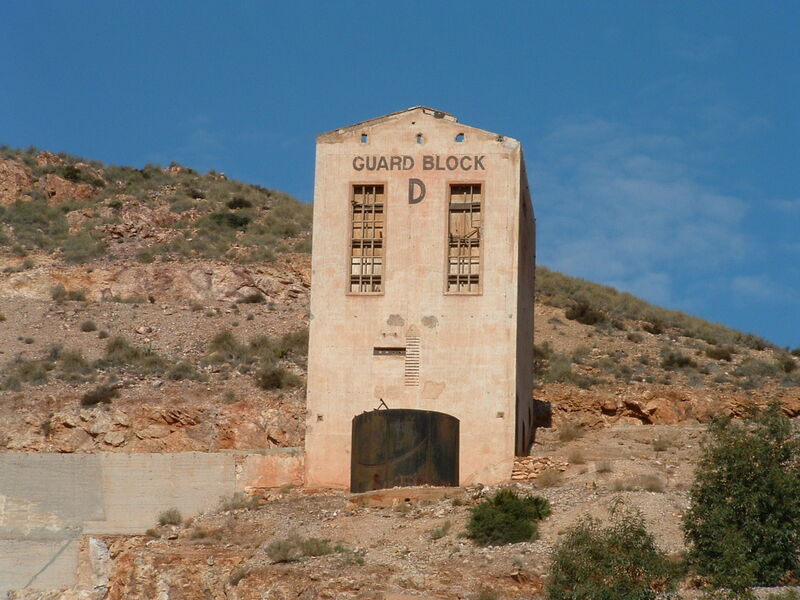 I saw this quote: " the writing on the tower was from the American ownership but I don't know what it meant " in reference to a building with "Guard Block D" painted on it. Well, this "Guard Block D" is from the movie "SolarBabies"! I just thought you might be interested. I think it would add a fun side-note to your VERY interesting web site. On other sites, I've seen some pictures of the other buildings at Rodalquilar and some show "Dorm Block A" and "Dorm Block B" and so on... this is also from the "SolarBabies" movie. Yeah, the movie isn't too great, but it was interesting to find out where it was filmed! 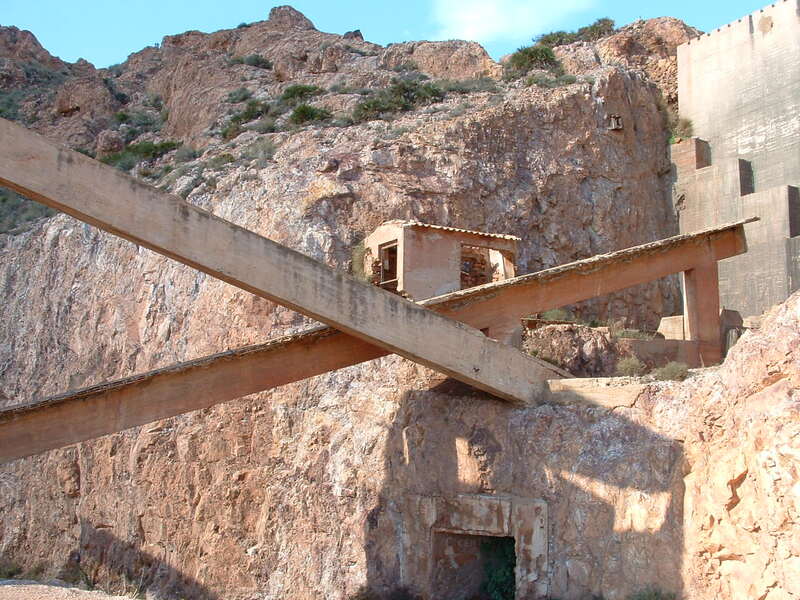 Gold was only the last in a long line of products mined in the Cabo de gata. The Exhibiton Hall has a series of posters showing mining from the Copper Age to the present day. It also has a splendid model of the mines and the Denver Plant. Click on the link below to see them. If you would like a more detailed description of the history of Rodalquilar Gold Mines, click on the link below to see it.